Towards the end of the summer, I started getting this intense, deep pain that felt like it originated from inside my right shoulder socket and it went up the right side of my neck. I noticed that riding on the highway for extended periods (more than an hour) exacerbated the issue. At first I thought it was from playing guitar, then maybe riding my mountain bike (both of which I spend a great deal of time doing). After taking a break from each to isolate the cause, it turns out that it's the motorbike. I've had numerous bikes before (WR250, DR-Z400) and never had this issue. After taking a break from my much-loved activities and spending some time off the FZ, I tried it again. Sure enough, tingling in my right hand and issues with my right shoulder again. I do have a little rizoma fly screen on my bike, but I'm not sure how much of a difference it makes from being totally naked...Anyways, my bike hasn't been starting as well as it used to, so I think another throttle body synch might be in order. If anything, that should reduce the vibes and help with starting. I have proper motorcycle gloves as well. Anyone else have similar issues or any information they could contribute? 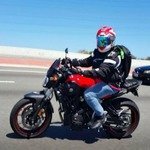 You don't need a motorcycle forum; GO to the doctor!!! And, the sooner, the better! All the best with it. Location: Sun City Center, Fl. Yes, go to a doctor. Maybe it can be 'fixed'. The vibration most likely can't be. (not 100%) Every bike I've ever owned or rode and everyone I've ever met that rode said there's always some vibration. My shoulders and neck stiffen up and I get pain after each ride but that's from holding my head with extra weight on it in an unnatural position for too long. That may be the case with your arm. Riding isn't for everyone, you may have to go for a sporty little convertible. Iif I had to get rid of my bike I would get a sporty, nimble, fun, convertible Miata. Good luck! You need to see a specialist about that. That tingling in the hand and fingers could turn into total numbness which could be dangerous while riding. It is obviously a mechanical issue with your neck and/or shoulder. A nerve could be impinged in your neck. Also could be nerve or blood vessel impingement where they exit the shoulder area to proceed down the arm. I'm not a doc but I do A LOT of reading. Being it only occurs while riding it may be because of riding position along with wind. Try a windscreen and see if it helps. I would still consult a professional about it. I know a bit on anatomy being in med field a long time ago. I was a pathology assistant. My patients couldn't complain. It was an experience. Take care and hope you're having good rides. Go ahead. Pick on the short guy. Wait... I'm short. Agree with FG here. I slipped two discs in my lower neck a few months ago. C6 and C7 for those that know about these things. Anyway, the pressure of the discs on the spinal cord caused tingling in my index and middle finger of my left hand. It's not so bad now, so I'm back on a bike and enjoying every moment. But, do see a specialist as the pain can really get you down and a CT scan or MRI will give you not only answers, but hope! hope all is well obama care! I have the same thing, but on the left side. Mostly goes numb at night no matter how I sleep on it, goes numb then burns then tingles like a mofo. Only happens when I'm lifting/moving alot of lumber etc at work, when work is light it goes away. Used to have a ton of numbness on rides on my gs500.